As displayed in Output 120.1.1, when there is only one cluster, the cluster component (by default, the first principal component) explains 58.41% of the total variation of the eight variables. The standardized scoring coefficients in Output 120.1.1 show that each cluster component has similar scores for each of its associated variables. This suggests that the principal cluster component solution should be similar to the centroid cluster component solution, which follows in the next PROC VARCLUS run. 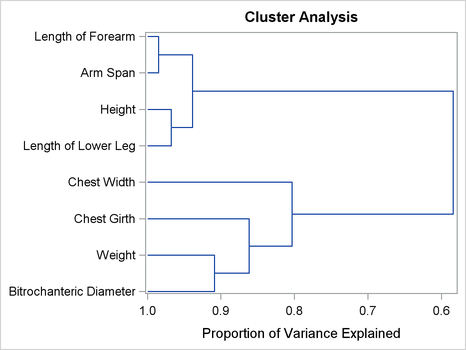 The first cluster component, which in the centroid method is an unweighted sum of the standardized variables, explains 57.89% of the variation in the data. This value is near the maximum possible variance explained, 58.41%, which is attained by the first principal component shown previously in Output 120.1.1. The default behavior in the centroid method is to split any cluster with less than 75% of the total cluster variance explained by the centroid component. Since the centroid component for the one-cluster solution explains only 57.89% of the variation as shown in Output 120.1.2, the variables are split into two clusters. The resulting clusters are the same two clusters created by the principal component method. Recall that this outcome was suggested by the similar standardized scoring coefficients in the principal cluster component solution. The results from PROC VARCLUS are shown in Output 120.1.3. The principal component method first separates the variables into the same two clusters that were created in the first PROC VARCLUS run. In creating the third cluster, the principal component method identifies the variable Width. This is the same variable that is put into its own cluster in the preceding centroid method example. The tree diagram in Output 120.1.4 displays the cluster hierarchy.